Alright. I have a secret… I don’t like yellow bananas. At all. Not even a little bit. Most people are all over the yellow bananas, some really enjoy when the banana starts to develop it’s sugar spots (the dark brown spots on a banana). So what kind of bananas do I like you ask? Green ones. That’s right, my favorite time to eat a banana is when it’s still completely green. And I don’t mean “a tinge of green”, I mean, a nice light grass green color. I don’t know what it is, I find I enjoy the texture more for bananas (though most people think they’re hard) but I think what I really love is the taste of a developing banana, before it gets too sweet and mushy. However, I missed my chance with some bananas I recently bought. They were one of the brightest green shades I’ve ever bought so far and I was throughly enjoying slicing up some banana and putting it into my apple and cinnamon oatmeal. But once I ran out of my oatmeal, I completely forgot about the bananas. Until I looked over into the fruit bowl, and noticed that horror to horror, they were no longer green! Instead, they were bright yellow with dark brown spots. I knew that if I didn’t do something about these poor bananas, they’d end up going bad (we seem to forget where fruit is until it’s too late in my house). So, I decided to make something I’ve never made before: banana bread (this should tell you that I really AM just beginning to get serious about baking). I decided that instead of looking online through some of my favorite blogs, I should actually open up one of my baking books and break it in! I used this recipe from Williams-Sonoma Essentials of Baking (first edition, which means I got it for $11 when it’s normally $50!) on page 94 for their Banana-Nut Bread (I didn’t use nuts). 1. Position a rack in the middle of the oven and preheat to 350 degrees. Butter a 9×5 loaf pan or three mini loaf pans. 2. 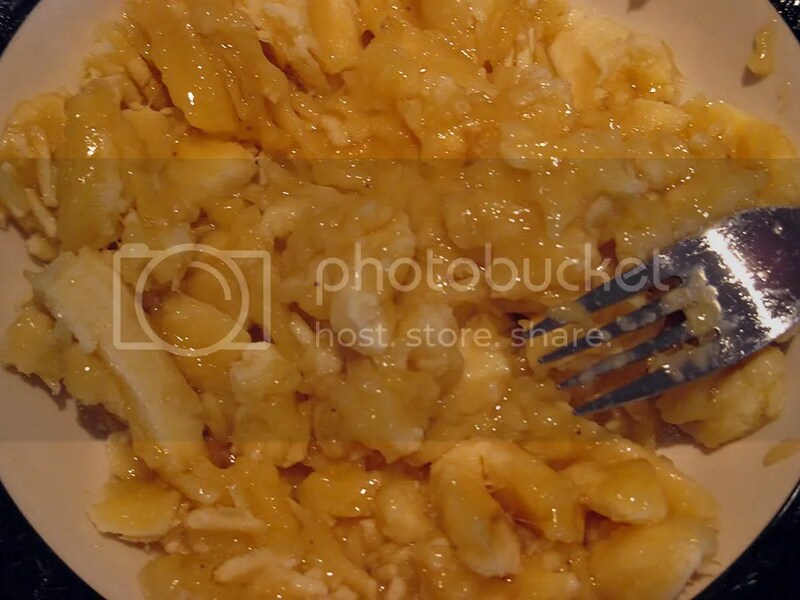 In a small bowl, mash the bananas. You should have about 1 1/2 c.
3. 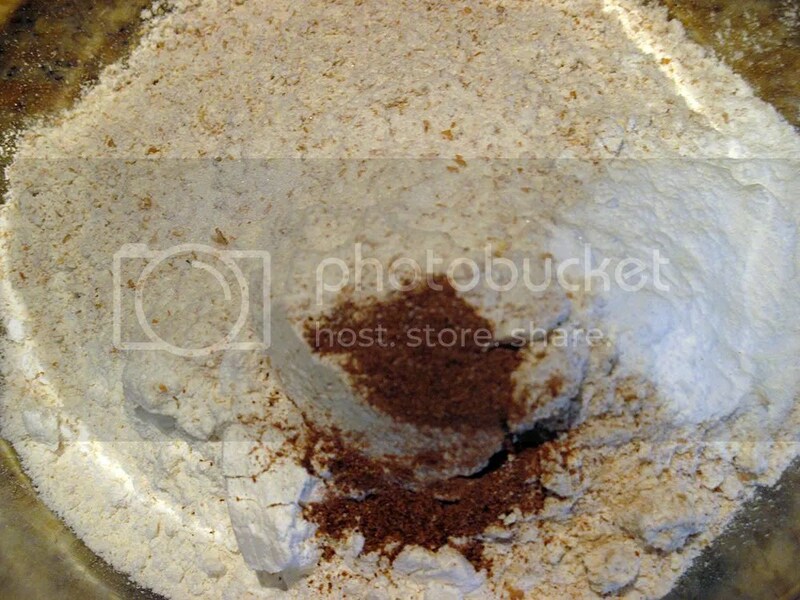 In a medium bowl, stir together flours, baking powder, baking soda, salt, nutmeg, cinnamon, and chopped walnuts. Set aside. 4. 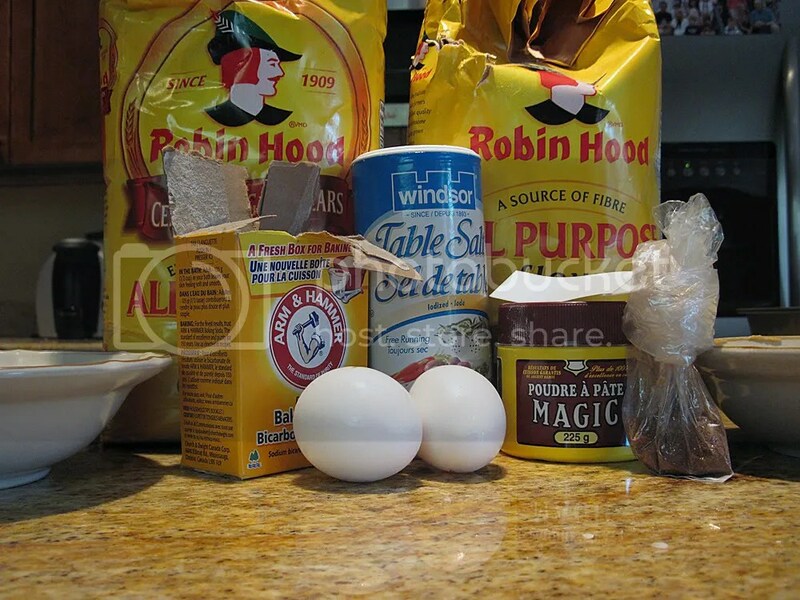 In the bowl of a stand mixer fitted with a paddle attachment, combine eggs, brown sugar, butter, and milk. Beat on medium-low speed until just blended. 5. 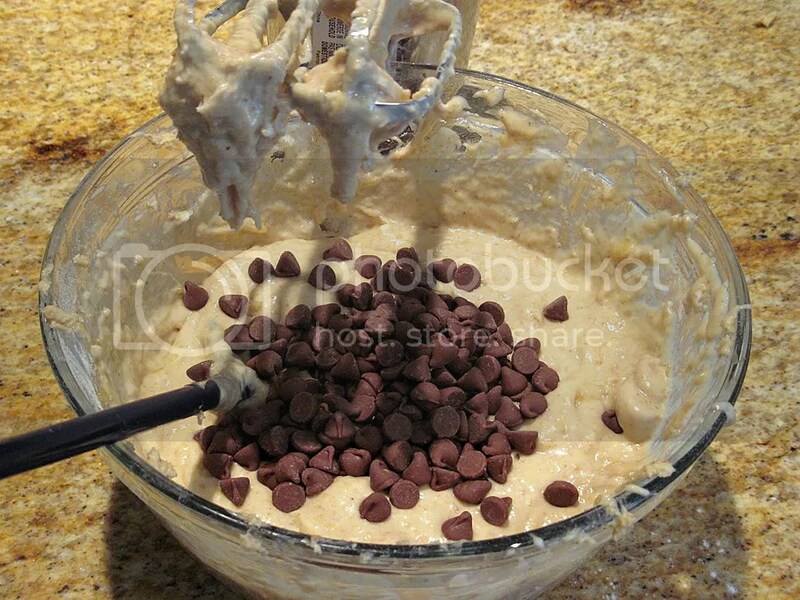 With the mixer on low speed, add the dry ingredients in three batches, alternating with the bananas, and beginning and ending with the dry mixture. Do not overmix. 6. Pour the batter into prepared pan or pans and smooth the top. If desired, sprinkle Demerara or Turbinado sugar over the tops and stud with a lone of walnut halves. (Again, I used chocolate chips). 7. If making one loaf, bake approximately 55-60 minutes, or until a toothpick inserted in the middle comes out clean. If the surface gets too brown, cover with foil for the last 15 minutes. If making mini loaves, put the three pans on a baking sheet and bake for 25-30 minutes. 8. When done, remove from oven and place on a wire rack to cool in the pans for five minutes. If making one loaf, turn out on to the wire rack after five minutes to cool completely. Store in an airtight container at room temperature for two to three days or freeze for up to one month. This recipe was very simple to follow. The only thing that took long was the actual baking (55 minutes in a 350 degree oven). I didn’t have any nuts (nor did I really want to use any) so I decided to use some milk chocolate chips to jazz up this recipe. Bananas and chocolate is always a tasty combo. One thing that did happen was that when I mixed the dough, it got really sticky, really quickly and totally over took my hand-held mixer (as in, went up past the beaters). I then realized the reason was because it was sticky because I forgot to mix the bananas in at the same time as the dry ingredients (I was in a bit of a rush when making it as I had my pumpkin blondies baking in the oven, and a Genetics midterm to study for). 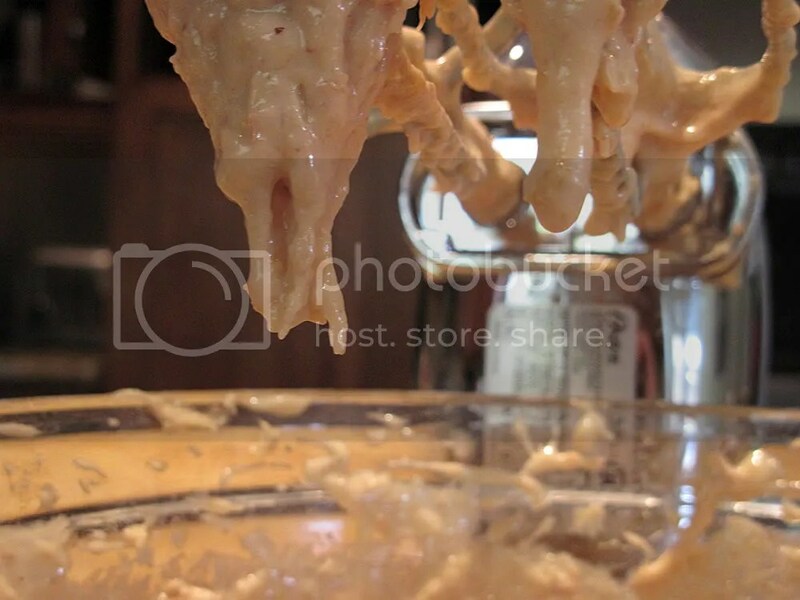 However, with the addition of your bananas, the dough was still quite sticky, but not as bad. 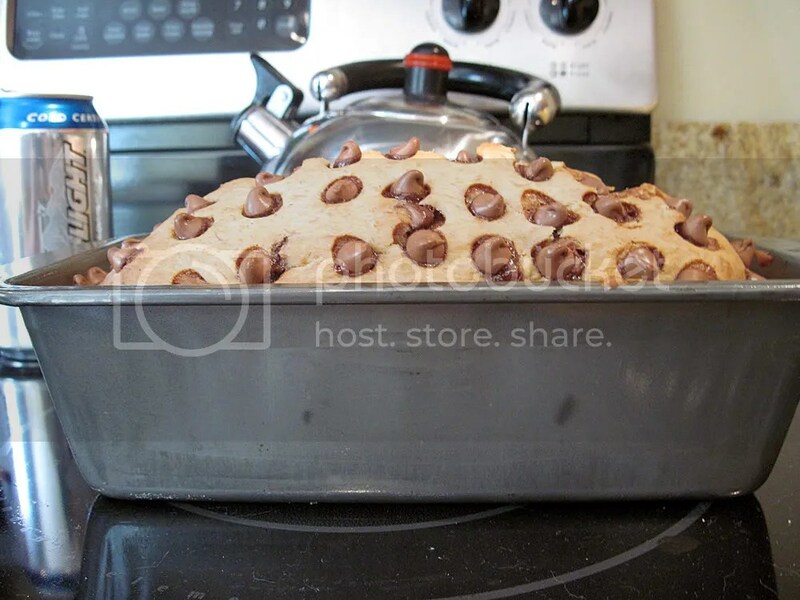 Once I put my dough into the loaf pan, I studded the top with some chocolate chips (I realized that they’d probably end up melting and I’d have a topping of chocolate, which wasn’t bad, but then this didn’t end up happening! 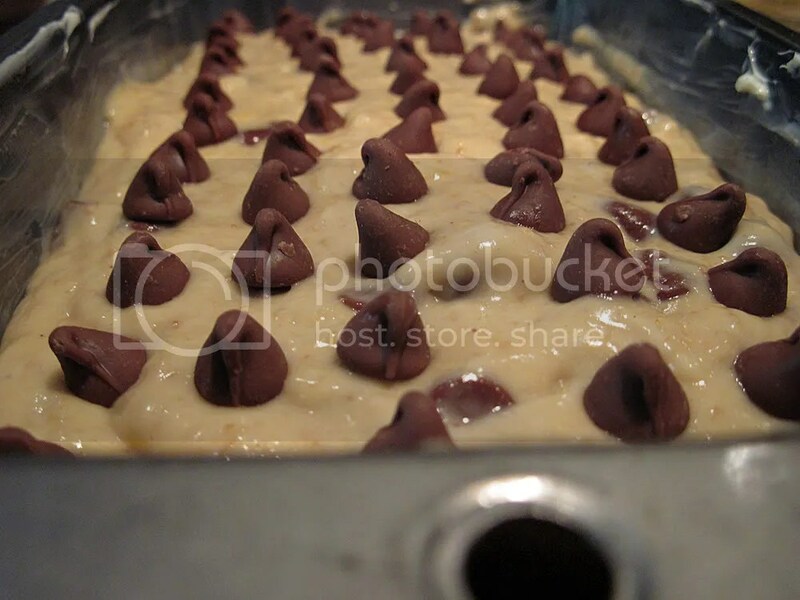 Those chocolate chips have a way high melting point) so that it could look nice and pretty. This was easily one of the best banana breads I’ve tasted (though keep in mind, I haven’t had very much! Banana bread isn’t a big thing in our house). It was really moist and delicious (I used 3 bananas) and again, chocolate and banana were made for each other. One thing I think that could have improved this was to swirl in some nutella, but that may push the chocolate a bit too far. Another thing that I found weird with this recipe was the amount of baking powder it wanted (2 tsp). For future reference, I’m always very paranoid when it comes to baking powder because I have a nasty habit of misreading tsp as tbsp and end up using way too much baking powder (which is disgusting). When I was making the dough, what I could really smell was the baking powder and this just made me even more paranoid that I messed the recipe up. However, (relieving-ly!) I didn’t. It turned out just fine and this banana bread puffed up very nicely. I have an aunt that only eats green bananas too! I personally prefer yellow ones.